As a native plant, cross vine has a big advantage – it’s easy to grow, hardy, tolerates the heat, has a low water requirement, and can grow in both full sun and part shade. It’s in the same family as trumpet creeper (Bignoniaceae) and the flowers are very similar – trumpet-shaped, 2″ long tubular and bright orange-red/yellow. 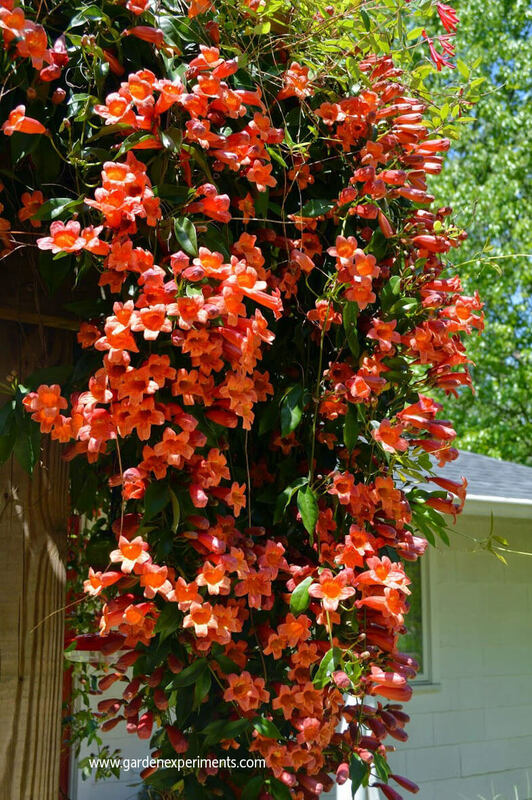 Cross vine is native to the Southeast from Florida to Texas and up to West Virginia: Zones 6-9. My first encounter with cross vine was rowing in a boat along a river and seeing it flowering at the top of the trunk of a pine tree. The flowers of this particular plant were a mix of orange-red and yellow. It’s a prolific bloomer – see photos from my arbor – and blooms in early spring throughout the summer. Another great thing about this vine is it is semi-evergreen. The leaves on the vines that are on my arbor survived winter temperatures of 9 degrees this year. It’s nice to have a constant green cover on the arbor. The only drawback of this vine is that is a fast grower and will require a couple of trimming/trainings a year. 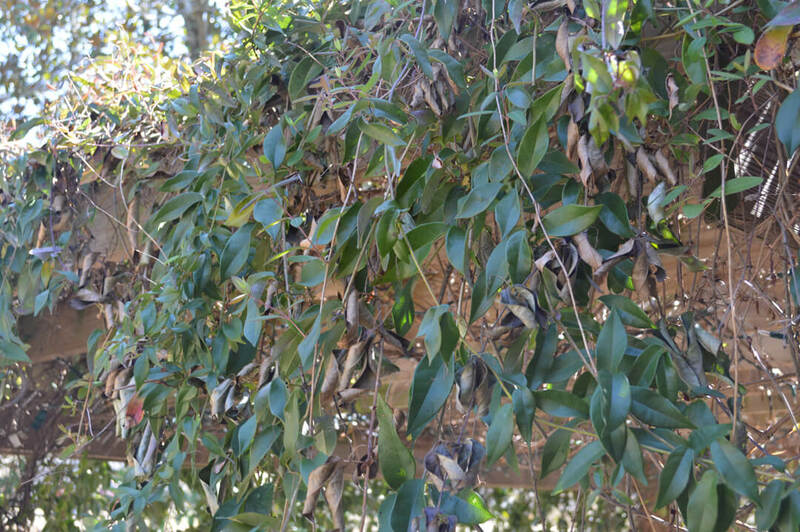 The opposite leaves appear waxy and the vine produces tendrils to assist it with climbing trees, walls, and trellises. While you can plant it in both part shade and sun, you’ll get more flowers in full sun. It tolerates a wide range of soil types, so you should be able to plant it almost anywhere. Water it while it is young, to get it established, but once it is established it has low water requirements. The vine is both heat and cold tolerant and it’s perennial. However, in many locations it will be evergreen. Be sure to actively train the vine to grow where you want it to and cut it back from places when needed. You can take these cuttings to make new vines! Cross vine can be grown from seed, cuttings, or root cuttings. 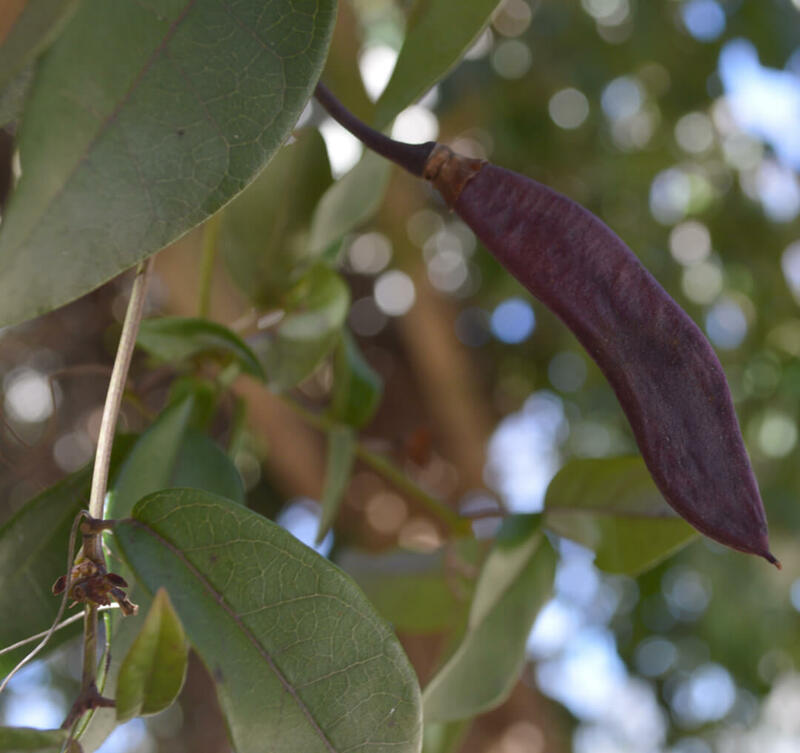 Seeds should be collected when the pods appear light brown and dry. They can remain viable for up to a year if kept in a sealed container in a refrigerator. Root cuttings should be immediately planted, watered, and protected until established. The same goes for softwood cuttings. Protect these cuttings from drying out and from harsh sun until they are established. The cuttings will do best if started in June or July and may take up to 8 weeks to produce roots. 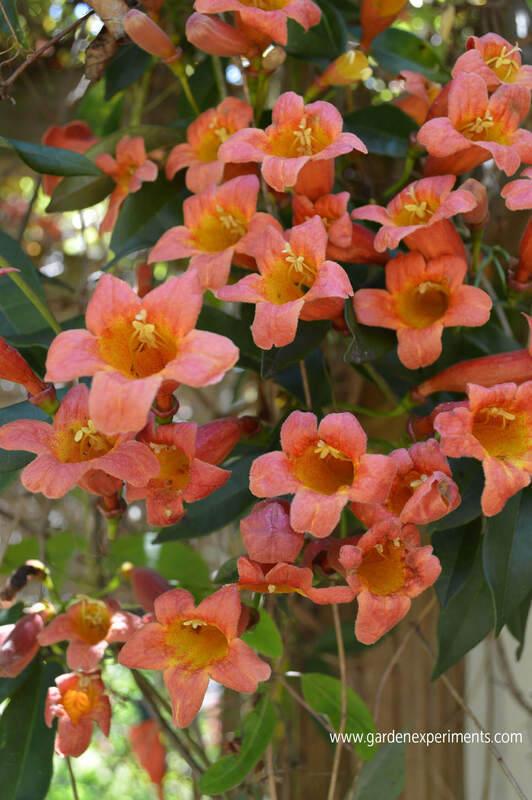 As you would expect with an orange-yellow tubular flower, hummingbirds and bees are attracted to crossvine and are an early source of nectar in the spring. I have noticed that the crossvine on my arbor has become thick enough to create a small specialized habitat for lizards, insects, and other small creatures. I am always careful to wear gloves and make plenty of noise to warn the critters when I am trimming the vine back. The USDA plant profile describes the source of the name cross vine. If you cut the stem and look at a cross section of it, the pith (the middle part of the woody vine) is in the shape of a cross. I always wondered where the name came from. pole in the fornt of her home. At first glance, I thought it was a tree. dead vines from underneath the dome making it look more appealing. cold. Please, any advice you could offer will be greatly appreciated. Wow, that sounds like a beauty. In my zone, the leaves are evergreen. But I usually wait to trim mine back until the flowers are over. And often, I have to trim it back more than once in the summer since it grows quickly. It’s pretty hardy though, so I wouldn’t worry too much about when you trim it back as long as you do it before the leaves fall off and the plant is storing its food in the stems. 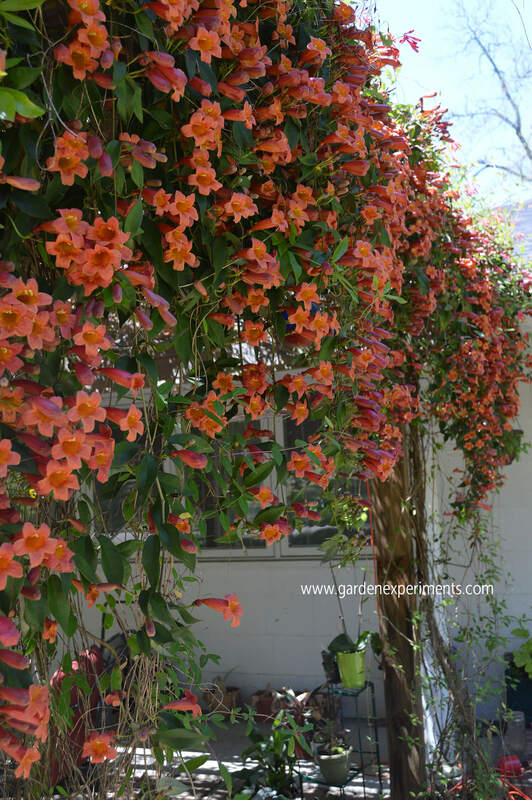 I always like to research answers so I found this on Fine Gardening that says it “flowers on old wood, so only prune immediately after flowering” http://www.finegardening.com/tangerine-beauty-cross-vine-bignonia-capreolata-tangerine-beauty. Hope this helps!